This book started out twenty years ago as my doctoral dissertation at Yale, written under the supervision of Hans W. Frei. I had already developed the idea of “motifs” as a way of introducing students to Barth. When I sat down to write my dissertation, I had expected to discuss them only briefly in the preface. As it turned out, however, the preface took over the work! Since then I have continued to read Barth and teach his theology on a regular basis. I have found that explaining these “motifs” still helps students to gain a better grasp of his theology and to read him without becoming discouraged by the difficulties. It is almost always better to read Barth than to read about him. But reading him, as everyone knows, is not easy, and it helps to have some guidance. Since he is one of the greatest – and most inspiring – theologians in the history of the church, the richness of his work repays every effort to understand him. I keep reading him, because I keep learning from him. I find that the more I know, the more he has to teach me. I also find that when I feel depressed, he cheers me up! At least three new insights have emerged for me in reading Barth, and my students have also found them to be helpful. The first is rather simple but well worth knowing. Every “paragraph” in the Church Dogmatics is written around a single main point. Even when the Absatz may run on for more than one page, as sometimes happens, the rule holds. What this means is that it becomes possible for the reader to reconstruct Barth’s overall outline. Reconstructing the outline is not only a very good discipline, but also a way of not getting lost. By looking for the outline, one keeps one’s head above water. Every page of Barth’s dogmatics is literally teeming with ideas. It is all too easy to get diverted by an arresting point or by mistaking the part for the whole. I find that by digging for the main point of each Absatz and writing it down, I can help my students follow Barth’s argument much more readily than would otherwise be the case. Then, of course, it also helps to look for the sub-points within the Absatz, of which there are usually quite a few. All this may seem rather pedestrian, and indeed it is. Nevertheless, I have found it to be a most valuable procedure in reading the Church Dogmatics. Another deceptively simple point for the beginning reader is to keep an eye out for the antecedent to Barth’s pronouns. Almost everyone has had the experience of reading Barth, feeling that one is following the train of thought, and then suddenly getting to the bottom of the page and finding that one is hopelessly lost. At this point it is easy to give up with the sense that Barth is just too hard to understand. Very often, however, all that has happened is that the reader has lost track of the antecedent to Barth’s many pronouns. (I can’t imagine what it would have been like to try to follow this material, which began as classroom lectures, by ear.) In any case the pronouns are like the bread crumbs in “Hansel and Grettel”. One only needs to trace them back in order to get out of the forest. For an especially vexing passage, I sometimes underline the antecedent twice, once I have retrieved it, while then underlining the subsequent pronouns once. The passage is then much easier to follow if I need to revisit it for purposes of further study or instruction. Finally, there is the matter of actualism. Even as I was writing this book, I felt that I didn’t have it fully worked out. Now after all these years I think I have a better grasp of its peculiar complexities. Much of what is distinctive in Barth, as well as much of what is difficult, hangs upon it. As these comments suggest, Barth saw the person of Christ in his finished saving work as subsisting in three tenses. The past tense of salvation – consisting of his life, death and resurrection – was always definitive and constitutive. By virtue of his resurrection and ascension, however, those events of the past did not remain merely past. Through Word and Sacrament, in the power of the Holy Spirit, they continued to occur in a new and different form in the present. Salvation’s present tense, however, could give only a secondary and derivative form here and now to what had already been constituted there and then. The past-tense form and the present-tense form were seen as two forms of one saving event, or better, as two forms of the one person of Christ in his saving work. There was, however, also a future-tense form, which was final and unsurpassable. The promised future would bring the glorious revelation of Jesus Christ in his universal saving significance. It is important to note, however, that Barth has often been misread here. Throughout his dogmatics, revelation always involved an ontic as well as a noetic component. With regard to salvation’s future tense, the ontic element meant that the universal unveiling of what had been hidden would also mean the radical (ontic) transformation of all things. Unveiling would mean universal transfiguration. The present tense of salvation was not only secondary and derivative. Relative to the promised future, it was always provisional and anticipatory as well. The result was a kind of double asymmetry. On the one hand, the past-tense form of salvation (which Barth called “reconciliation”) served as the ground for which the future-tense form was simply the consequence, because the past tense-form was necessarily always constitutive. On the other hand, however, salvation’s future-tense form (which Barth called “redemption”) was the goal and fulfillment for which the past-tense form was simply the necessary precondition. Beyond these two relational patterns, there was no higher synthesis. The person of Christ in his work was a complex event that always formed a unity-in-distinction. Although the ground/consequence pattern dominated Barth’s dogmatics, he did not live to finish the project. As intimated at various points along the way, the precondition/fulfillment pattern was the great conceptual reversal that would have dominated Barth’s unwritten volume V on the doctrine of Redemption. 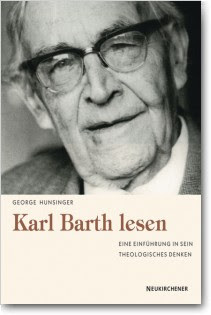 Barth also conceived of the one Jesus Christ in his threefold temporal form (Heb. 13:8) according to the logic of the trinitarian perichoresis. What he once said in a more limited application indicated the logic of the three forms as a whole. “Each of them also contains the other two by way of anticipation and recapitulation, so that without losing their individuality or destroying that of the others, they participate and are active and are revealed in them.” Each form of Christ’s person in his work was seen to dwell in, and be active in, and be revealed in the others. Each contained the other two by way of anticipation or recapitulation. They were three temporal forms of one and the same saving event. They did not differ from one another by degree, nor were they three parts adding up to a larger whole. They indicated three different forms of one and the same person of Christ in his unique saving work – yesterday, today and forever. Barth’s actualism was a matter of one indivisible event in three dynamically coinherent forms.